I was cycling up to the top of another hill. On a normal day, it wouldn’t feel so steep and I’d probably ride up it okay without having to stop. But, this was no normal day. The wind was blustering right into my face and Savannah sat behind me in a little caboose. From her grin, you wouldn’t know that she screamed for a good half an hour before we could get her to sit in it. It’s not that she doesn’t like exploring with us on a bike. She loves it. 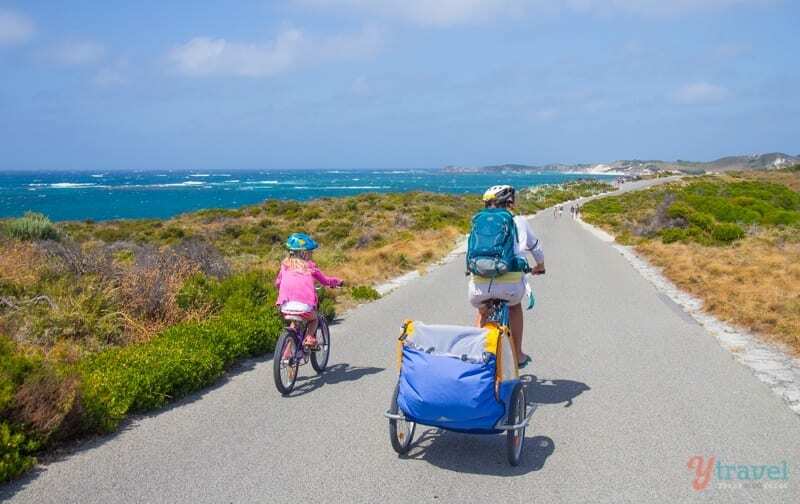 But, before suiting up for this bike ride around Rottnest Island, she’d spied a super cute pink tricycle and wanted to ride that one. All our attempts to explain that she wouldn’t make the 10km ride got blown away by her screams. I can’t remember how we managed to get her in the caboose after her massive tantrum. I think the attendant bribed her with stickers and an ice cream at the end of the journey. Or maybe the ice cream bribe came from me? Whatever the bribe, she refused to get in the caboose unless I was pulling it. 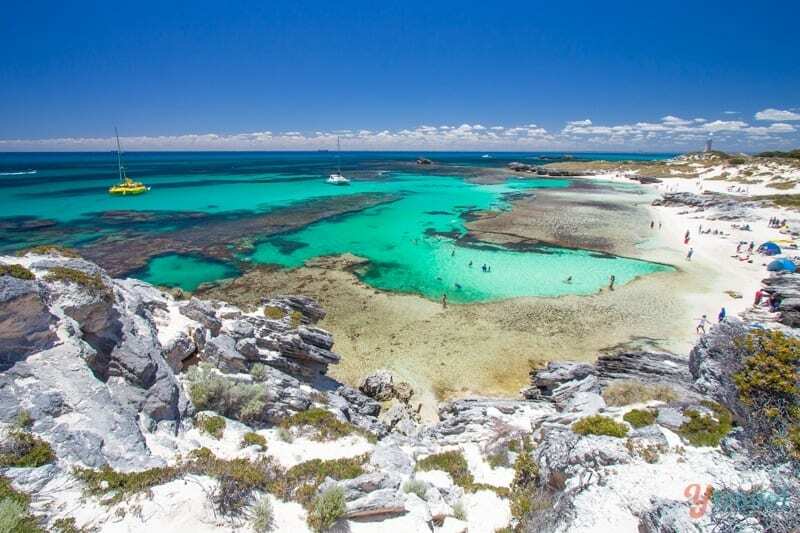 I’d cycled around Rottnest Island ten years earlier with my sister and remembered it being strikingly beautiful. I didn’t remember wind like this. 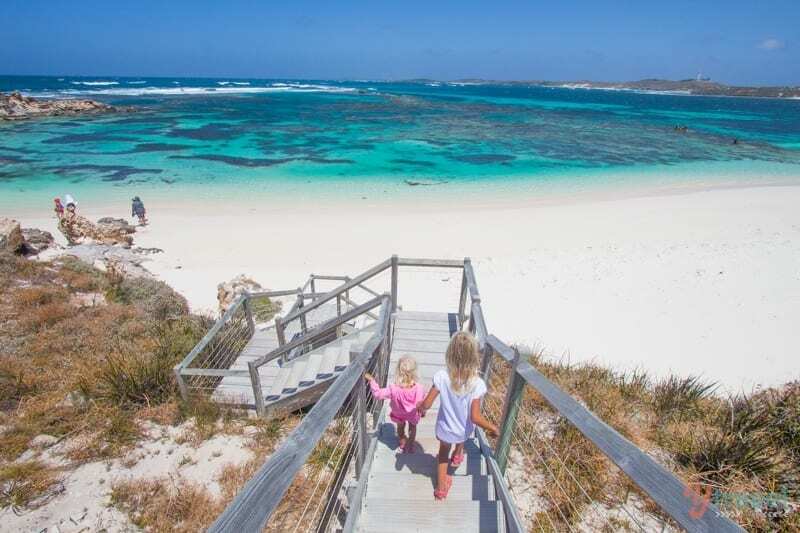 You can be sure if it’s windy on the mainland, on Rottnest it is double the force. Today it felt like triple. 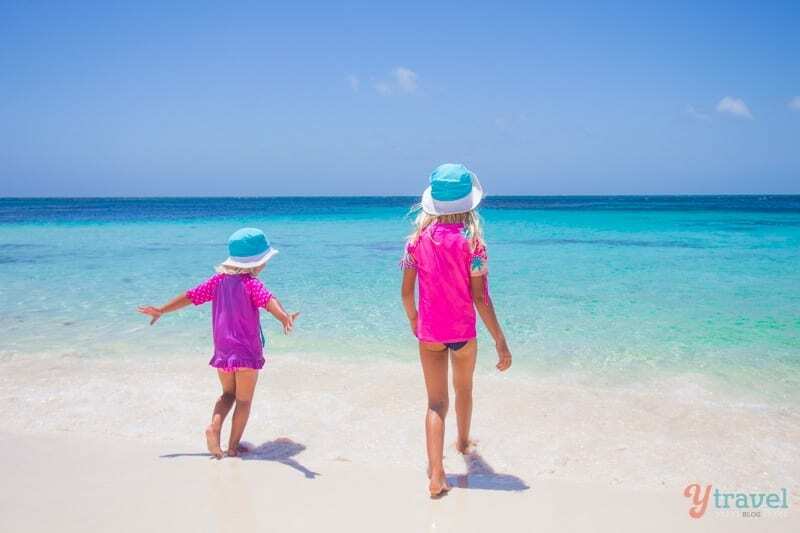 Our visit to the island was short, and since the sun was shining when we woke, we decided it best we capitalize on that so we could see the pure beauty of the turquoise water as the sun beat down. We didn’t appreciate the force of the wind until we turned into it making our way to our first stop of Henrietta Rocks, a place known for snorkeling and popular with moored boats. I didn’t remember so many hills when I biked with my sister either. I’ll never forget them again. I felt every rising gradient of them, panting heavily to pedal my sluggish body, and Savannah’s now happy one, up the hill. No words were able to escape from my mouth to answer her constant chatter. We made it to the top of the rise and prepared for the downhill coast. But the wind forced as backwards shouting a “take that” to gravity. We’d made a serious error in choosing to take on this grand adventure on this day. Only two nights before we had flown in to Perth after a massive 30 hour trip home from Raleigh, North Carolina. We had jet lag on top of jet lag. On top of that was an intense two weeks of business and social events in the US. I didn’t have the stamina to get up those hills without the wind there. Instead of enjoying this adventure I’d dreamt about, I was resenting it and considering turning back. This was just not enjoyable. I was convinced that pretty soon Kalyra would have one of her tired meltdowns, which would have just tipped me off the bike and rolling down the hill to an end that spelt RELIEF. We stopped at Henrietta Rocks for a collapse. I’m not sure why Savannah lay down on the table, she’d had it so easy getting dragged up those hills while squealing that I needed to go faster. Should have let her ride that tricycle. The view was spectacular and took my mind of grunting for a wee while. I was transfixed on the boats sitting on what looked like glass. The colours swirling turquoise, green and aqua around them. A few people lingered at the water’s edge, their toes dipping in, contemplating whether it would be more enjoyable to bask on the glistening white sand or to dive in and explore the underwater world. A few English tourists walked up the stairs, snorkels in hand. That was me then. The views from the hill top will do. Saved me a walk down the stairs. 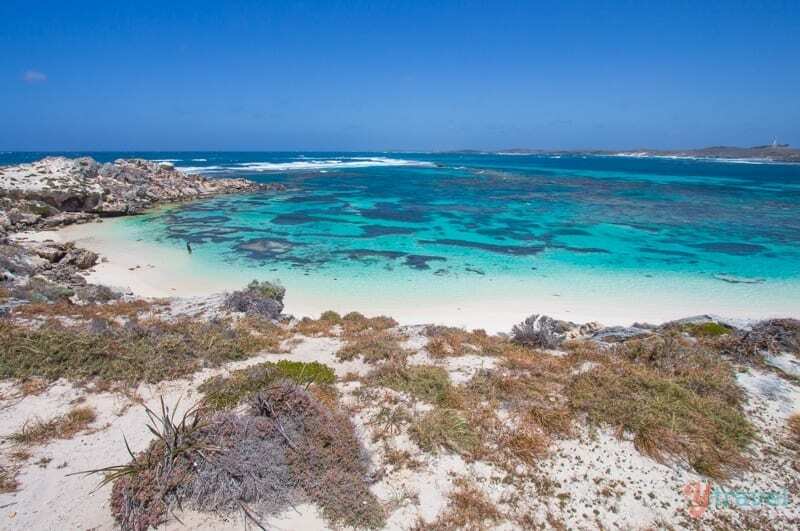 Once you’ve snorkelled at Ningaloo, it’s hard to find something to compare. Yep, after 16 months of Australian highlights I’m jaded. We decided to push on. Finishing the loop would take us around to Little Salmon Bay and then to the lighthouse. From there, we’d be heading north riding with the wind. I only had about another twenty minutes of headwind stuff to get through. I was sure I could make it. That was until I rounded the next bend straight into the full force of the wind. Holy hell. I don’t think I can do much more of this. I had a sense that this was an order I had to follow. I pulled up on the bike, took the map out and reassessed. It probably wouldn’t have made much difference to turn around. We were almost half way round the loop, and from my vantage point, it was pretty much downhill with a side wind instead of a head wind. The view told me what was coming was pretty special. We’d come all this way, we might as well keep on going. I put my big girl pants back on, pressed down on the pedal and then saw the wiggling out of the corner of my eye coming across the road. I pulled up immediately knowing it was a snake. Earlier that morning I’d seen a sign warning that poisonous snakes were in the area. I looked back and saw Kalyra pushing down on her pedals with Tour de France force timing a perfect roll right over the snake. “Stop. Stop. Stop. Stop” I screamed putting my hands out the side to catch her and Craig. She pulled up in time right beside me. “There’s a snake”. She watched it slide away in fascination. I did with relief. If I had not stopped to look at that map, I would have continued cycling, the snake coming across the road after unseen by me. Kalyra would have ridden over it without a doubt. I thanked that voice for telling me to stop. It never was trying to guide me to turn around, it just needed me to halt for a minute. The jet lag disappeared and an alert AWE took over me. How many times are we guided by nudges and intuitive voices that save and protect us from dangers we often don’t even see? Here I was having this incredible experience, in one of the most beautiful destinations in Australia, if not the world, and I was cranky and grumbling and not enjoying the miracle of it. It took a close brush with a snake to snap me out of my depressed lethargy, to get back into the present and enjoy the moment. I knew that the snake had arrived with a message for me. Pay attention. Quit whining and enjoy this beautiful day. Contemplate your blessings and be grateful. My eyes refocused back into wonder and the rest of the ride around the island was magical. Savannah continued to giggle and babble in the back. Kalyra continued to whee with delights down the hill. She didn’t lose her cool, and when I saw it almost approaching, I quickly stepped in with promises of ice cream at the end of the bike if she was able to make it the whole way around. Without complaining and with sheer joy. It turned out to be one of the most enjoyable days of our trip, despite the wind and my crappy attitude, and all because of a slithering poisonous snake carrying a message rather than a bite. We only managed do to the short half island bike ride. 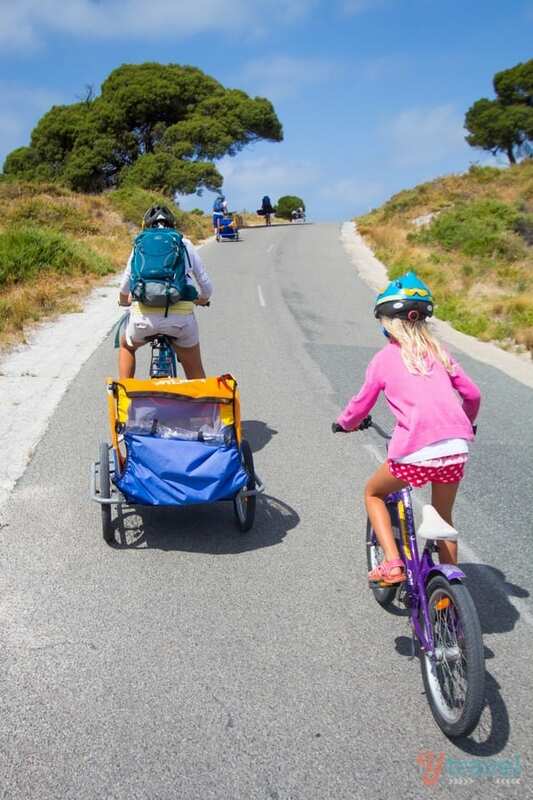 For the fit and strong and childless, there is a full 22 km you can do around the island. 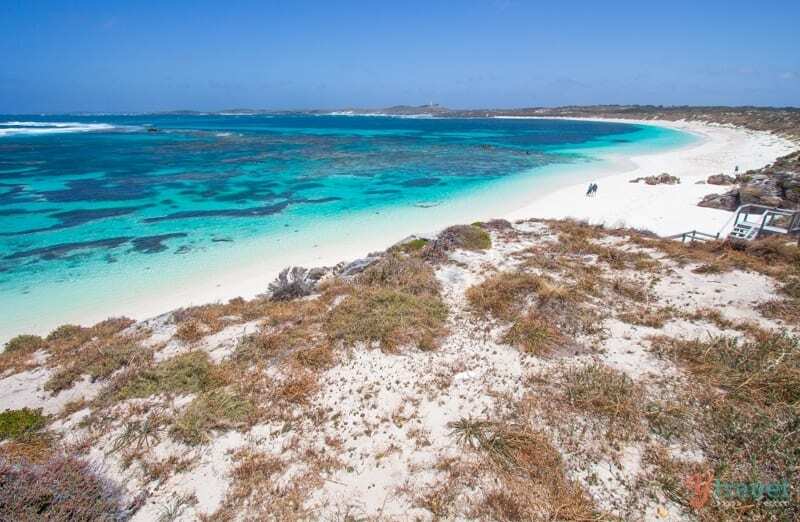 It’s not well-travelled so there are many beautiful beaches you’ll have to yourself. But, what you’ll see on the shorter way is equally beautiful and diverse. We stopped at Little Salmon Bay for a short play and rest on the sand, whilst daddy had a quick snorkel. Cycling inland we went past the Wadjemup Lighthouse, making the sensible choice to look at it from below rather than cycling up the hill to see it up close. The wind was behind us now and we went racing through the middle of the island feeling sorry for those passing us into the head wind. 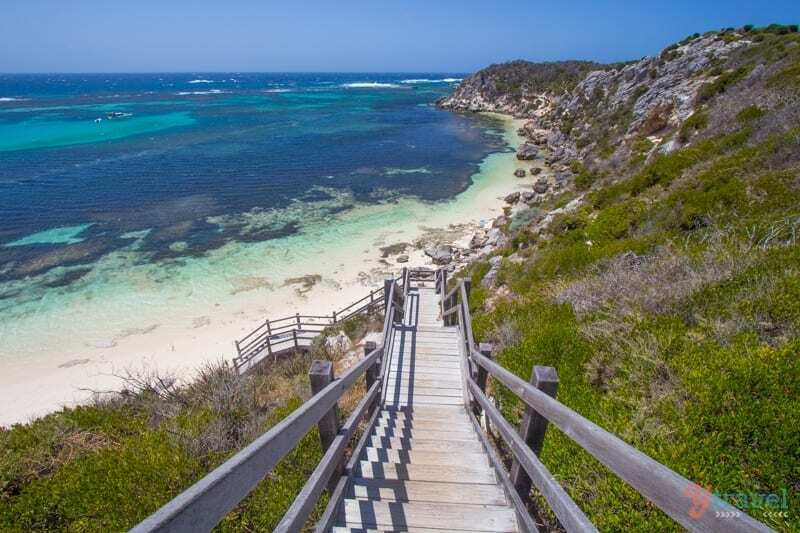 Through the middle of the island are the many lakes of Rottnest. 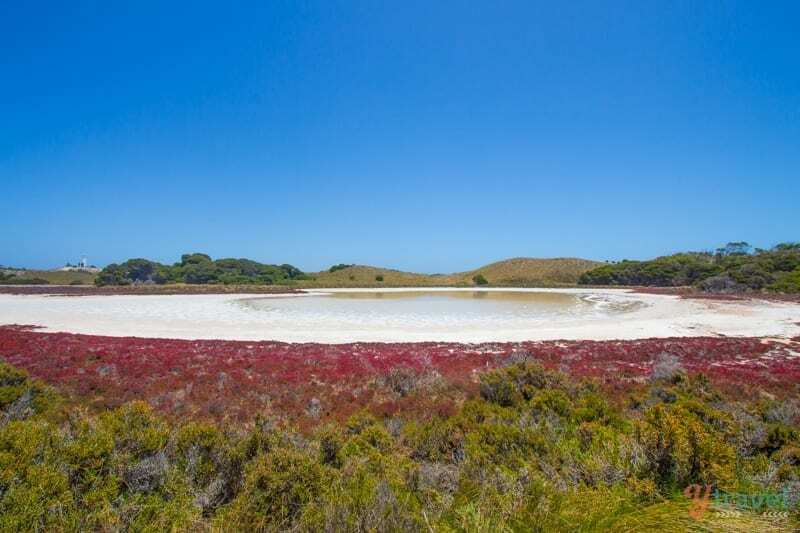 These lakes have a pink hue thanks to the algae and minerals present in the water. You can learn all about it as you cycle past. 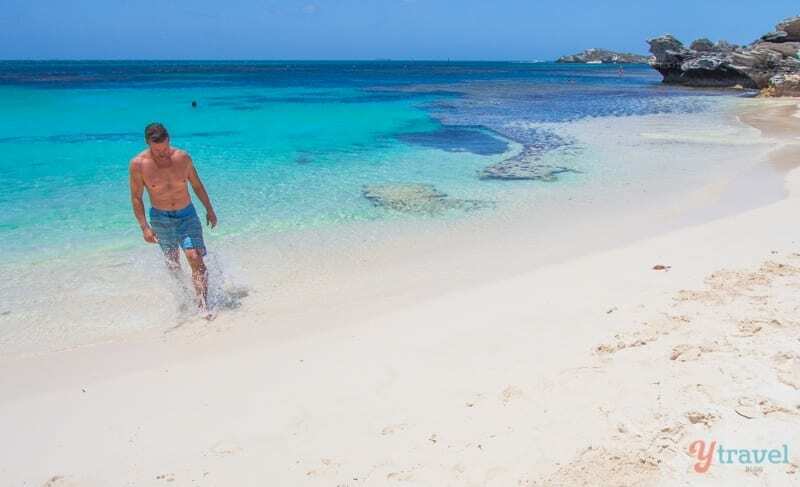 Once we hit the north of the island, we decided a stop at one of the sheltered beaches for some lunch and a swim. We were pretty hot by now and felt the full force of the sun once we were out of the wind. Parakeet Bay was recommended to us as the most sheltered place to swim on a windy day. Our community are never wrong with their suggestions for us. We found a spot by the rocks to have some lunch and then enjoyed a refreshing swim. 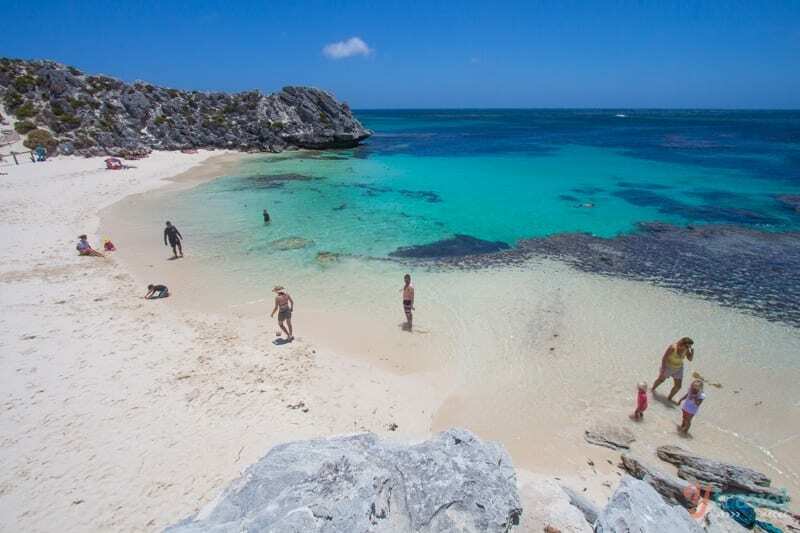 The water at Rottnest is pretty chilly so be warned. 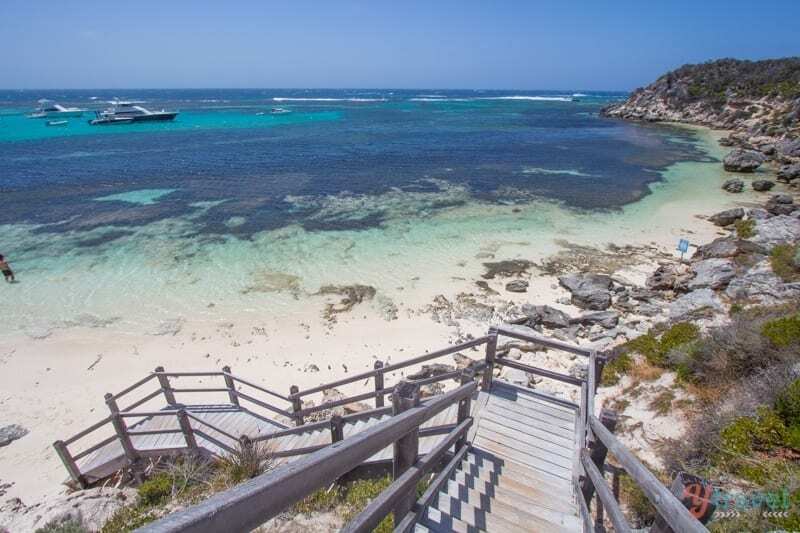 This is also a great snorkeling area, but I have slight nervousness about swimming in Western Australian waters with the presence of sharks. Seeing a man wade into the water in a shark resistant wetsuit only upped the fear so I stayed in quite close to shore. 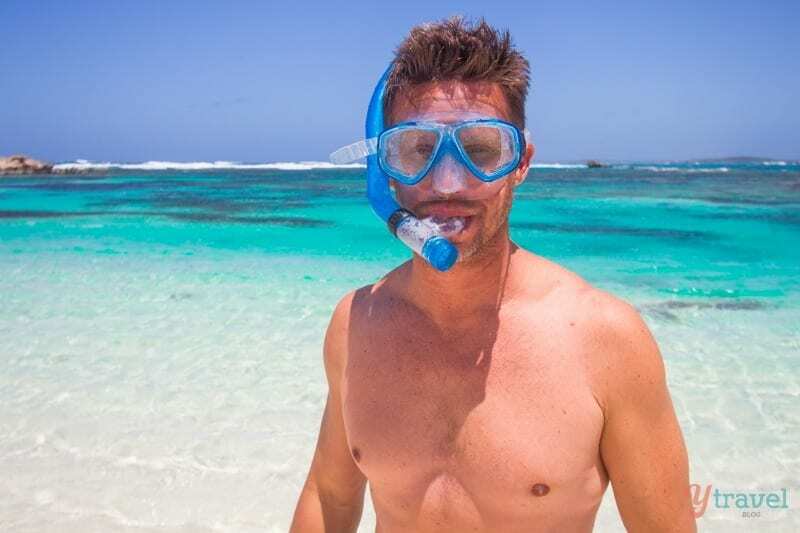 You might not be as fearful as me, so don’t let my frets get in the way of your snorkeling fun. Later that afternoon Craig and I celebrated our achievement with an ice cold beer at the Rottnest Pub which has spectacular views. And knowing we’d engaged in some much needed exercise before hand, they went down guilt free! I’m so glad we didn’t quit before we even got started. 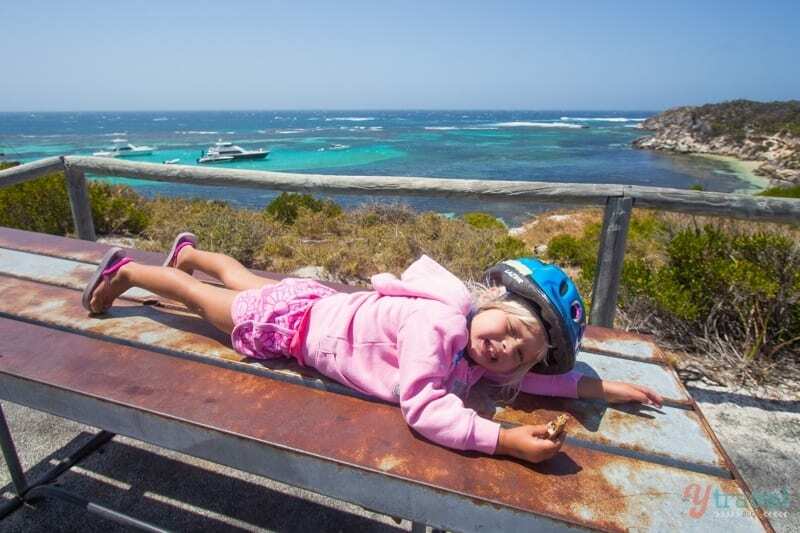 Rottnest Island is best explored by bike! 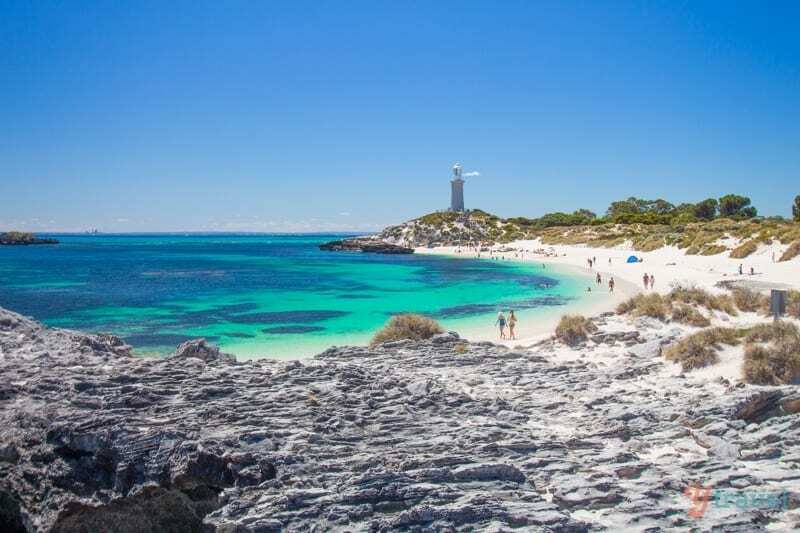 To read more about Rottnest Island click here. 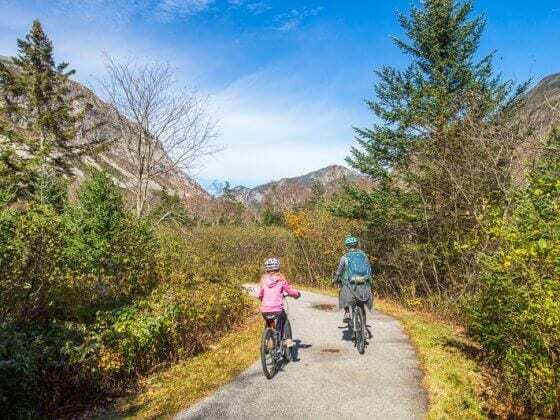 Relevant Reading: Biking the Stowe Recreation Path in Vermont. 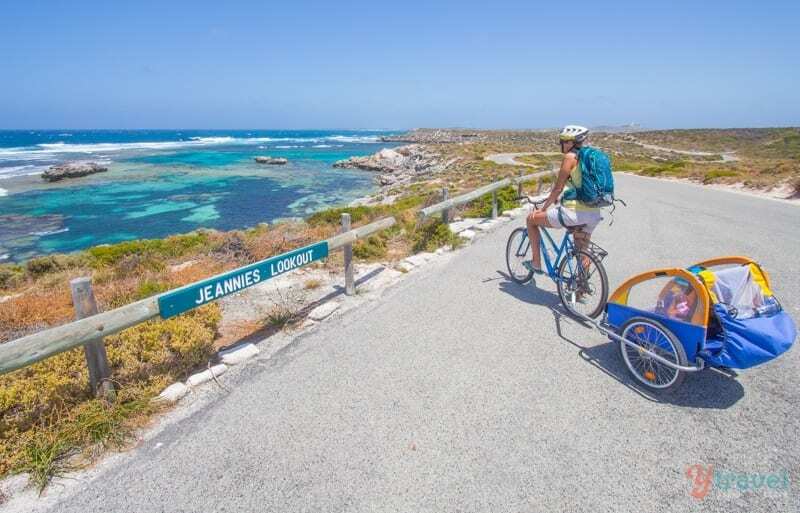 Have you cycled Rottnest Island before? What scenic location? Really loved this place and also the narration of yours for the place. Thanks. All around this was a nice article to read and enjoy. Strange heading.!! But liked it a lot.!! Quite amazed to see the pictures. Thanks for sharing these lovely scenic pictures.!! Wow!!! Those photos are amazing. You inspire so much! I have so many friends that say that cannot travel because of the children, that it is too difficult. I need to shopw them your blog and prove that it is easier than they might think. Wish you many more adventures. Another beautiful spot and great photos as usual. 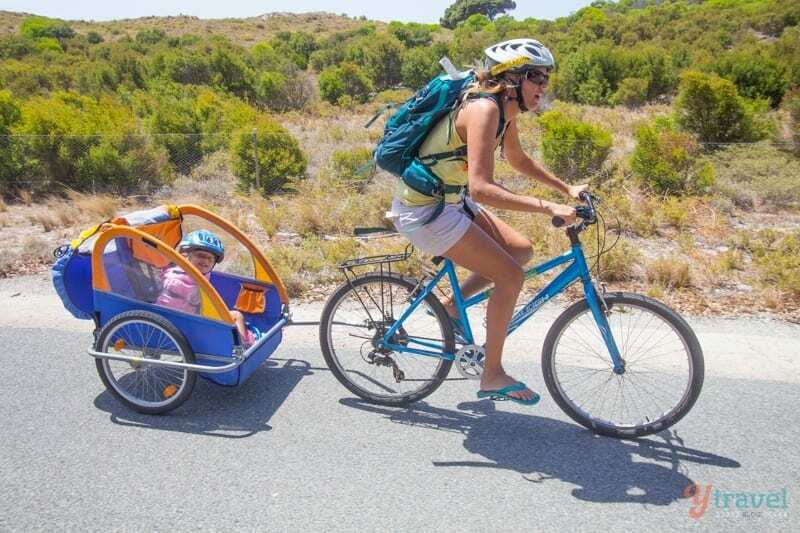 Kudos to you for riding with the baby buggy on the back, where there are lookouts there are usually hills I have trouble getting just me and my bike up! The Basin is pretty as always.. never gets old. It’s been a long time since I visited the area.. but the snake story was unbelievably amazing. It was pretty scary while I was reading it, but it turned out, the snake became a tool for you to get back to your senses. What a nice story. Wow, incredible ride along the coast, so beautiful! And what a wild story and great lesson to be had from it, it’s so interesting what you can take from experiences like this. Thanks for sharing! I hate snakes haha. Wow this island looks absolutely stunning! 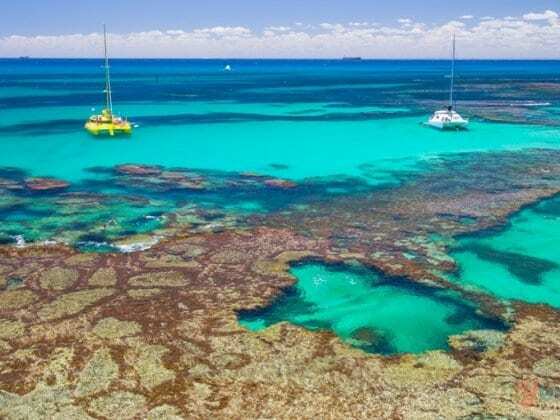 Your photos definitely make me want to visit so fingers crossed we make it back to Western Oz some time in order to explore it too! Lovely Pictures.!! Amazed. The last pictures talks so much about the happiness of these two people. Serendipity.!!! !